Ex-IRA member Quinn Carney and his family have gathered to bring in the harvest. The celebration stretches back centuries and brings the extended family together, so Quinn’s house is crowded. Along with his wife Mary and their 7 children, his brother Seamus’ wife Caitlin and her son Oisin have lived with them for the past 10 years since Seamus disappeared. There’s also a the Corcoran cousins, Aunts Pat and Maggie, Uncle Pat and their slow English neighbour Tom Kettle there to lend a hand. When unexpected visitors from Quinn’s long-abandoned past arrive with news of Seamus, Butterworth sets the ball rolling towards its tragic end in the wee hours of the morning. Like any family, there are a range of opinions that are the source of conflict. Aunt Pat is a vocal republican, plaguing the less interested young people with updates on the hunger strikes and curses against Thatcher. Shane Corcoran takes Pat’s radicalism even further, and at 16 he’s dangerously full of piss and vinegar (and Bushmills). Quinn carefully takes a more moderate view, though there is no one in the family that’s a loyalist. The tension occasionally boils over, but never fully dissipates even in the jolliest of moments and keeps the lengthy script from slowing. There are plenty of political parallels to be drawn between the world of the play and the present. The Carneys have a collectively fighting spirit with some passions burning brighter than others, but the general echo chamber and loyalty seen here is an indirect reminder of the importance of diversifying our friendship groups. The larger threat of domestic extremism that infiltrates their family and causes them so much pain is eerily similar to the white American fundamentalists who maim and kill in the name of freedom. Then there’s the similarity to other complex global conflicts resulting from colonialism – Israel and Palestine spring to mind immediately. Attributing blame here is impossible on a microcosmic level; these characters are at the mercy of vast systemic failure. Butterworth brings in an array of other themes: grief, unrequited love, sibling rivalry, capitalism, urban v rural life, the importance of family, tradition, and so on. Rather than feeling cluttered, this epic is utterly and totally alive. The Carneys are a normal family coping with extraordinary circumstances, not unlike the tragedies of classical theatre. The story is akin to a Shakespearian history play and will certainly endure well beyond its run. The cast are universally stunning, but there are a few particularly bright spots. Laura Donnelly is full of love and life as the no-nonsense Caitlin, and utterly magnetic. She’s the quiet centre of much of the action, but can also terrify and crumble. Paddy Considine showcases his impressive versatility as Quinn – a loving father, former thug, farmer and lover – all reveal themselves at one point or another. This earthy, visceral play is an instant classic. Enthralling from beginning to end, the imperfect humanity and perfect storytelling pay homage to the victims of Britain’s colonial heritage, and still maintains current relevance. This is the writer-driven British theatre at its best. 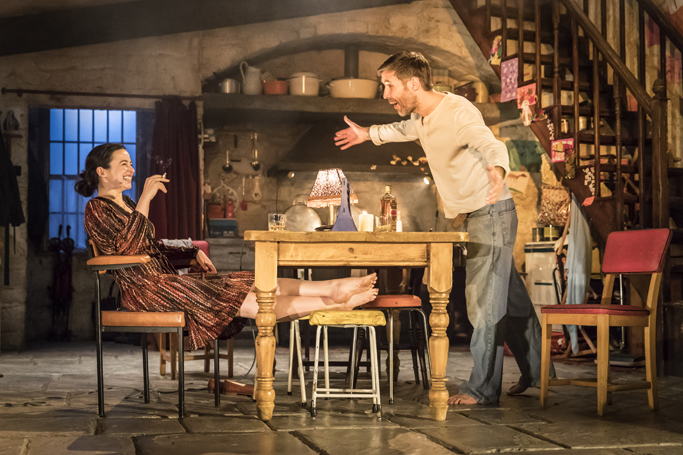 The Ferryman runs through 20 May, then transfers.